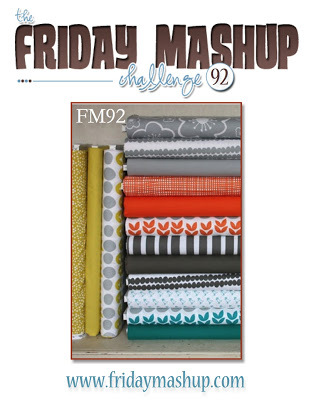 This week at The Friday Mashup Amy is bringing us a mashup that's all about color and patterns! She wants us to use different patterns on our project plus at least 3 of the challenge colors. The only color I didn't use was Summer Starfruit. I cannot lie...I do not like that color at all, it just does not work for me. But I included all the other colors! I didn't go crazy though with the patterns...does the embossing on my Island Indigo strip count? Make sure you head over to The Friday Mashup and play along with us, we'd love to have you! Make a project using "Different Patterns". Or Make a project with the three or more colors from "Summer Starfruit, Tangerine Tango, Island Indigo, Early Espresso and Sahara Sand". Or "Mash it Up" and create a "Patterned Project with the Challenge Colors". I know what you mean about Summer Starfruit! When I first saw it I thougt it was gross, but weirdly its kinda grown on me lol! Great use of patterns with the dsp and embossing! Gorgeous card Lisa! I love the combination of Tangerine Tango and Island Indigo. You combine all the colors perfectly. Great card, Lisa! I love the Island Indigo strip. I love the colours you've picked from the challenge to use here. This is so pretty! I like the narrow dark mat behind the DSP, it really makes the pattern pop from the card. The layered greeting is so pretty!